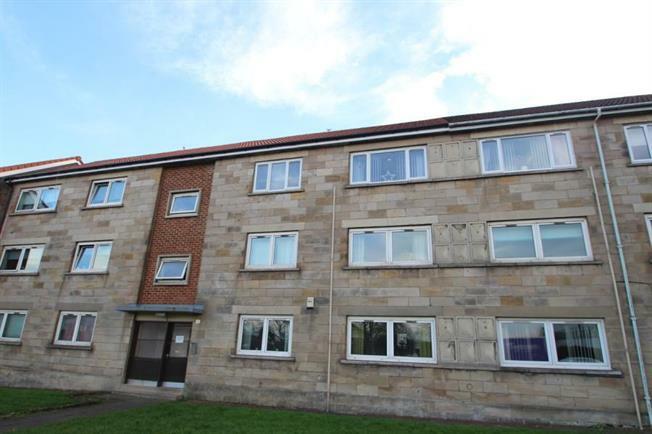 2 Bedroom Upper Floor Flat For Sale in Glasgow for Offers Over £67,000. A beautifully presented and spacious two bedroom top floor flat set within a popular and convenient location being in close proximity for Barrhead Town Centre and its wide range of amenities. The building itself has benefitted in recent times from a new roof and external rendering. This accommodation within this exceptional family property has been well maintained and upgraded by the current owners and is sure to appeal to a variety of discerning purchasers. The accommodation comprises of a welcoming reception hallway incorporating several storage cupboards. The front facing lounge/dining room is spacious and bright with the adjacent modern fitted kitchen having just been installed. The impressive kitchen offers ample storage and certain quality integrated appliances. Furthermore there are two double bedrooms and a family bathroom. The specification of the property extends to wet electric central heating via radiators, double glazing , secure entry and well maintained communal gardens to the front and rear. Internal inspection is highly recommended in order to fully appreciate the quality of the accommodation on offer as well as the popular and convenient location.